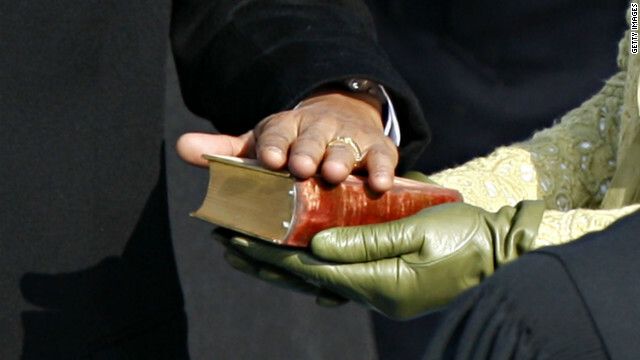 President Barack Obama's go-to Bible when he takes the oath is the same one used by former President Abraham Lincoln. (CNN) – With President Barack Obama's second inauguration just days away, CNN Radio explores the one figure who has been omnipresent at these ceremonies: God. From the oaths of office and speeches to invocations and Bibles used, religion has been woven into this day since President George Washington made his first address to a fledgling nation. Join CNN's Lisa Desjardins on a journey into God's place in U.S. inaugural history. Free speech helps educate the masses................POLITICIANS too !............maybe next time it won't be. Gravity is not up for debate ! Einstein's Gravity Theory Passes Toughest Test Yet..............................E = mc2..........(U–Pb).................two math formulas. Of course atheist are dems and it burns them up that Obama actually professes a faith but what is more comical is that the atheist beleives he practices that faith. The day will come when the mystical generation of Jesus…will be classed with the fable of the generation of Minerva in the brain of Jupiter. Bless your heart, Jesus loves you. Open your heart and let Him in. So it's mentally advanced to deny the laws of science? Matter comes from the lack of matter? Reason from nothing? Order from chaos? A frog can evolve into a butterfly? You are one of those tards they just wrote an article about who constantly use quotes that are incorrectly attributed to Jefferson. Congrats scholar! Seriously dude,give it a rest. Please read the book of Romans in the Scriptures for the perfect description of yourself and all who reject God. Pay particular attention to verses 21 to 32. Heaven is a spirit state as noted by both Pope John Paul II and Augustine– Jesus and Mary's bodies nor anyone else's bodys are in heaven i.e. there were no bodily resurrections, ascensions or assumptions and there never will be any. See added details on p. 2. Thank you for the clarification. What JPII said did not state that physical bodies were not capable of existing in the state of being that is "Heaven". What he, and Aquinas, were saying is that our words and concepts as humans here on Earth are not adequate to describe Heaven. Heaven is a place where glorified bodies exist, but as they must share this "place" with angels (spirit-only) and God, this "place" must be befitting of them, and since God is not contained by time or space, it would only be reasonable for a place like Heaven to be outside those confines (containers) as well. Regardless, the Pope's Wednesday audiences do not qualify as "ex-cathedra" teaching, and Aquinas was never a Pope, so neither of these can be used as infallible doctrine set by the Magisterium of the Church. Do you dream in black and white or color? When you are dreaming ..can you see, do you have a sense of touch, can you smell, is there an environment around you? Dreamer, actually what Reality was trying to prove was that infallible Church teaching (and the Bible) are wrong because a Pope and a Saint (Thomas Aquinas, Doctor of the Church) said that Heaven is a spirit place, and that it cannot include physical bodies. The Bible says that we will be resurrected in body and that we will live for eternity in Heaven with God. As Christians (at least as Catholics, and most Christian denominations) if you believe what the Bible says, we have to believe that. His premise was that if the Pope and a Saint said that, it would disprove the Bible and therefore disprove Christianity as a whole. But, as I noted above, his premise is both incorrect and faulty. Oops sorry for noting Augustine and not Aquinas. "Latter-day Saints like M. Romney also believe that Michael the Archangel was Adam (the first man) when he was mortal, and Gabriel lived on the earth as Noah." Mohammed had his Gabriel (this "tin-kerbell" got around). The Abraham-Moses myths had their Angel of Death and other "no-namers" to do their dirty work or other assorted duties. Contemporary biblical and religious scholars have relegated these "pretty wingie/horn-blowing thingies" to the myth pile. We should do the same to include deleting all references to them in our religious operating manuals. Doing this will eliminate the prophet/profit/prophecy status of these founders and put them where they belong as simple humans just like the rest of us. Some added references to "tink-erbells". "The belief in guardian angels can be traced throughout all antiquity; pagans, like Menander and Plutarch (cf. Euseb., "Praep. Evang. ", xii), and Neo-Platonists, like Plotinus, held it. It was also the belief of the Babylonians and As-syrians, as their monuments testify, for a figure of a guardian angel now in the British Museum once decorated an As-syrian palace, and might well serve for a modern representation; while Nabopolassar, father of Nebuchadnezzar the Great, says: "He (Marduk) sent a tutelary deity (cherub) of grace to go at my side; in everything that I did, he made my work to succeed." "TUBUAS-A member of the group of angels who were removed from the ranks of officially recognized celestial hierarchy in 745 by a council in Rome under Pope Zachary. He was joined by Uriel, Adimus, Sabaoth, Simiel, and Raguel." "In Zoroastrianism there are different angel like creatures. For example each person has a guardian angel called Fravashi. They patronize human being and other creatures and also manifest god’s energy. Also, the Amesha Spentas have often been regarded as angels, but they don't convey messages, but are rather emanations of Ahura Mazda ("Wise Lord", God); they appear in an abstract fashion in the religious thought of Zarathustra and then later (during the Achaemenid period of Zoroastrianism) became personalized, associated with an aspect of the divine creation (fire, plants, water...)." "The beginnings of the biblical belief in angels must be sought in very early folklore. The gods of the Hitti-tes and Canaanites had their supernatural messengers, and parallels to the Old Testament stories of angels are found in Near Eastern literature. " "The 'Magic Papyri' contain many spells to secure just such help and protection of angels. From magic traditions arose the concept of the guardian angel. " "Oops sorry for noting Augustine and not Aquinas." Not a problem, I obviously understood to whom you were referring. As for the rest of what you wrote, it does absolutely nothing to disprove Christianity. If you're going to use science and scientific reasoning as a tool, then use it properly. Present the theories with the facts and associated evidence to back them up, then let them stand on their merits. If they're true, nobody will be able to refute it. Just as a note, I came from your side of the argument. Eventually, I could no longer reasonably accept the explanation of the existence of the universe as science alone could explain it. Starting with a "big bang" that created matter out of none? Life came from none? Order came from randomness? And reason came from the lack of reason? All of those defy the laws of science. It is Called Principles not theories. Geology and climate have shaped the development of life tremendously. This has occurred in the form of processes such as the oxygenation of the atmosphere, mass extinctions, tectonic drift, and disasters such as floods and volcanic eruptions. Life, particularly bacteria, has also been able to impact the geological makeup of the planet through metabolic processes.
" Starting with a "big bang" that created matter out of none? Life came from none?" Your god came out of nothing and then this god created life from nothing. At least with since there are tested principles and peer reviewed studies of it. There is no proof of your god or peer reviewed studies on it. Excellent, let's examine the principals of evolution. Why, in all of these centuries has nobody been able to provide proof of observed speciation? As for "my" God, He always existed. Nobody made Him. An all-powerful, all-knowing, all-loving God could not be anything else as it would defy logic. Why in all the centuries since Jesus lived has no one observed him doing anything? They have. In fact, almost all modern scholars of antiquity agree that Jesus existed. Science cannot refute the teachings of the Bible. Never could and never will. In fact there are many scientists today studying the consciousness after death following Raymond Moody M.D, and his findings in the 70s. Moody's book Life After Life is a fascinating study of many people who clinically died and were revived. Their recitations are remarkably consistent. He shows writings by Plato and in the Tibetan Book of Life that corroborate these recitations. Deplited carbon is what happens when we die. I'm guessing you don't know what infallibility means. An infallible pronouncement—whether made by the pope alone or by an ecu.menical council—usually is made only when some doctrine has been called into question. Most doctrines have never been doubted by the large majority of Catholics. It does not mean the same thing as "impeccability". And the reason it's mentioned at all in this thread is that the original poster is trying to use official Church doctrine as a way to show that the Church's doctrine refutes its own teaching (which it does not). Why should I take seriously the words of someone who is a heretic? How dare you blaspheme and disrespect and insult those of us who are believers? I'm pretty sure the Pope doesn't say that the Virgin Mary isn't in Heaven both body and soul, especially when the Assumption on August 15 is Holy Day of Obligation and it is mandatory that Roman Catholics believe that specific dogma. I think you need to learn more about Catholicism and Eastern Orthodoxy which also shares a similar belief (except we believe Mary died first then was taken up body and soul). and dead. His kingdom shall have no end." Furthermore, at the end of the Nicene Creed, it says "I look for the resurrection of the dead, and the life of the age to come." NO TRUE CHRISTIAN would deny such a thing! Here is the Nicene/Constantinopolitan creed in its entirety in case you've never read it: It is said in all Eastern Orthodox Churches and a variation of it may be heard in Roman Catholic, Anglican/Episcopal and some Protestant Churches. It has been the touchstone of Christians for several millenia now. heaven and earth, and of all things visible and invisible. through Whom all things were made. of the Holy Spirit and the Virgin Mary and became man. and dead. His kingdom shall have no end. I confess one baptism for the forgiveness of sins. and the life of the age to come. Why should we take the word of someone who has been indoctrinated / brainwashed ? All you post is stuff that some men wrote a long time ago,None of what your book says is true and has no value at this point in the world. We do not need a book to tell us to be good to one another. Remember these words "Blasphemy is is a victimless crime"
Why doesn't Obama take his oath with a Koran? He hates the Bible and everything it represents, hates America and hates white people even though he is half white. Both of you are misinformed and delusional. do you have unrefutable proof of what President Obama does and does not believe or hate? please give us references to back up your commentes. Your an idiot, go throw up. Nobody cares! I care. And it's "you're," not "your," you blockhead. Other than the blockhead comment, finally something we can agree on, TT. You'd think people could keep straight the difference between possessive and a contraction. It's not that complicated. You + Are = You're.